One of those books that one really can’t say “I liked it.” It was a well written & compelling book but it was also depressing and ugly. Coming from a third-world country (Bolivia), I have seen first hand the kind of poverty and misery that one seldom sees in the U.S. We humans are resilient and we do manage to survive in circumstances that are incredibly desperate. I think this books represents just about any third-world slum. Especially true is the poverty “tax” people pay in their daily life in the form of bribes – in addition to misery poor people have little power fight the system which oppresses them. Interestingly, the oppressed add to their misery by oppressing their own. India is not unique in having this problem and, perhaps, was used because the problem is literally magnified by it’s large population. Yeah, as a species we remarkable in our ingenuity & resilience. Our will to survive is amazing & our ability to create normalcy under the most dire circumstances is what has made us one of the most wide-spread animals in the planet. Having attended celebrations and family dinners in El Alto (a slum area near La Paz, Bolivia) I know first hand that there is joy even in places we see as hopeless. 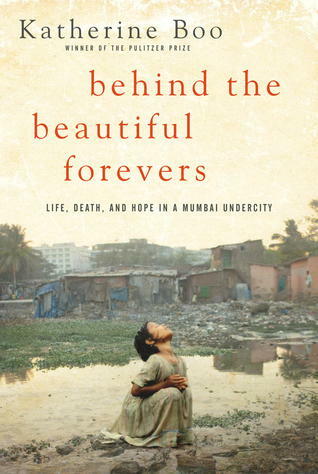 Categories: Reviews | Tags: Behind Beautiful Forevers, book review, Indian, katherine boo | Permalink.